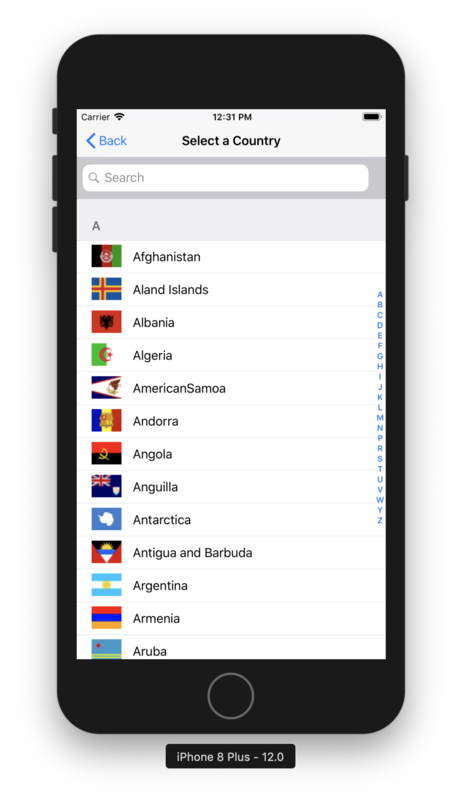 NMLocalizedPhoneCountryView is a simple, customizable view for selecting countries in iOS apps. You can clone/download the repository and run the demo project to see NMLocalizedPhoneCountryView in action. First run pod install from the NMLocalizedPhoneCountryViewDemo directory. Releases are Swift 4.2 compatible only. Put NMLocalizedPhoneCountryView repo somewhere in your project directory. In Xcode, add NMLocalizedPhoneCountryView.xcodeproj to your project. as an embedded binary on the General tab. as a target dependency on the Build Phases tab. 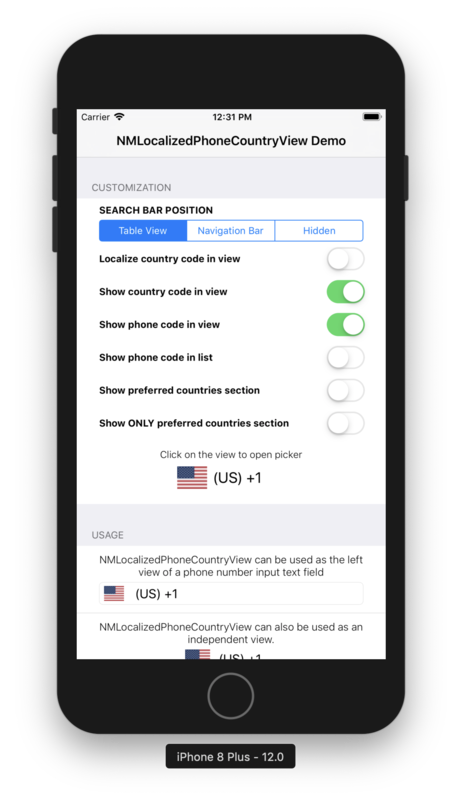 To get the selected country from your NMLocalizedPhoneCountryView instance at any time, use the selectedCountry property. This property is not optional, the default value is the user’s current country, derived from the device’s current Locale. You can also create see the list of states of your selected country. You can also create see the carrier codes of your selected country, if any. The default is empty carrier codes array. You can also see the Postal Code format for your selected country, if any. The default value is empty string. and see the same list of countries in other locale. We’ve use Arabic locale in our demo project. Create a new PR and add new country locale in the json file of the original library. Instead of using the countries list provided in CountryCodes.json file, you can use your own countries list either locally or from any API response and use it to populate the CountryView. Note: Make sure the response format is the same as the current one, as this structure is mandatory for the library to work. If the response format of your custom-countries-API is not correct, or it has wrong/empty data, NMLocalizedPhoneCountryView will fallback to our local CountryCodes.json file. Note: If you’ve not added the translation for any country for a locale, it will show default name in English. You have to pass the country codes of the excluded countries list in excludedCountriesList attribute of your countryView. Customization options for the view itself are available directly via the NMLocalizedPhoneCountryView instance while options for the internal CountryView table view are available via the NMLocalizedPhoneCountryViewDataSource protocol. Setting the NMLocalizedPhoneCountryViewDelegate protocol is also necessary if you wish to be notified when the user selects a country from the list. @IBOutlet weak var localizedPhoneCountryView: NMLocalizedPhoneCountryView! The datasource functions define the internal(country list) ViewController’s behavior. Run the demo project to play around with the options. An array of countries you wish to show at the top of the list. This is useful if your app is targeted towards people in specific countries. The desired title for the preferred section. func sectionTitleForPreferredCountries(in localizedPhoneCountryView: NMLocalizedPhoneCountryView) -> String? 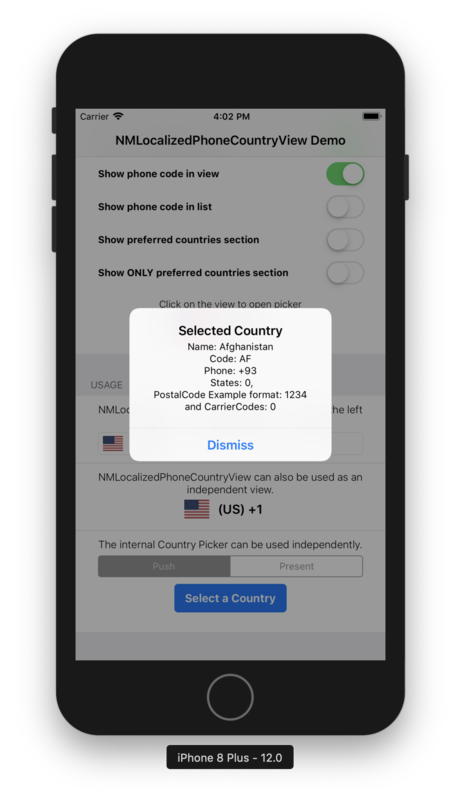 Note: You have to return a non-empty array of countries from preferredCountries(in localizedPhoneCountryView: NMLocalizedPhoneCountryView) as well as this section title if you wish to show preferred countries on the list. Returning only the array or title will not work. Return true to hide the internal list so your users can only choose from the preferred countries list. func navigationTitle(in localizedPhoneCountryView: NMLocalizedPhoneCountryView) -> String? func closeButtonNavigationItem(in localizedPhoneCountryView: NMLocalizedPhoneCountryView) -> UIBarButtonItem? Note: Any target or action associated with this button will be replaced as this button’s sole purpose is to close the internal view controller. Define normal font family for your NMLocalizedPhoneCountryView and define FontTrait for your UILabels inside NMLocalizedPhoneCountryView and NMLocalizedPhoneCountryViewController rows. Simplify override the values for selectedCountryFontTrait and countriesListFontTrait for NMLocalizedPhoneCountryView and NMLocalizedPhoneCountryViewController respectively. A good use case for NMLocalizedPhoneCountryView is when used as the left view of a phone number input field. @IBOutlet weak var phoneNumberField: UITextField! This means your users do not have to worry about entering the country’s phone code in the text field. This also ensures you get a valid phone code from NMLocalizedPhoneCountryView instead of relying on your users. 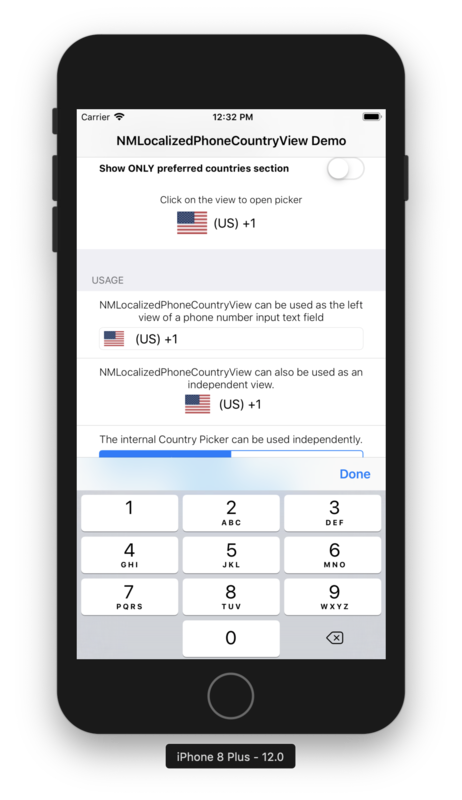 If for any reason you do not want to show the default view or have your own implementation for showing country information, you can still use the internal picker to allow your users select countries from the list by calling the function showCountriesList(from: UIViewController) on a NMLocalizedPhoneCountryView instance. It’s important to keep a field reference to the NMLocalizedPhoneCountryView instance else it will be garbage collected and any attempt to use it will result to a crash. In the example above, calling localizedPhoneCountryView.showCountriesList(from: self) will result in the internal picker view controller being presented in its own navigation stack because DemoViewController is not a navigation controller. Don’t forget to set a delegate to be notified when the use selects a country from the list. An example of how to use the internal picker view controller is included in the demo project. NMLocalizedPhoneCountryView is distributed under the MIT license. See LICENSE for details. "Namshi General Trading L.L.C": "[email protected]"